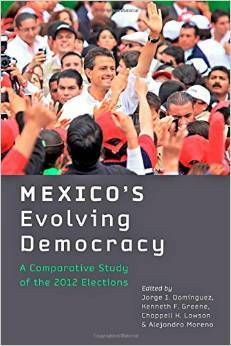 Mexico's Evolving Democracy: A Comparative Study of the 2012 Elections - Available now! In 2012, the Institutional Revolutionary Party (PRI)—which had governed Mexico with an iron grip for 71 years before being ousted in 2000—was surprisingly returned to power. In Mexico's Evolving Democracy, a team of distinguished political scientists delivers an exceptional analysis of the remarkable 2012 Mexican elections. Extending the scholarship that the editors generated in their panel studies of the 2000 and 2006 elections, the book assesses all three elections from both traditional and nontraditional vantage points, seeking fuller answers to the lingering question of why this maturing democracy returned the party associated with Mexico’s old regime to office. To evaluate the PRI’s rehabilitation and eventual electoral success, the authors explore Mexico’s electoral institutions, parties, candidates, campaign strategies, public opinion surveys, and media coverage. They also delve into issues of clientelism, corruption, drugs, violence, and the rise of new protest movements in the run-up to and aftermath of the elections. Not only does the book provide rich detail for Latin American electoral and democratization scholars, but its coherent narrative will also appeal to those unfamiliar with Mexican politics. Parts one and two offer an excellent recap of the "state of play" in 2012; part three analyzes why Mexicans voted as they did; and part four considers the election’s implications for Mexico’s political system more broadly. Alejandro Moreno is a professor of political science at the Instituto Tecnológico Autónomo de México and the director of public opinion polling at Reforma. Jorge I. Domínguez is the Antonio Madero Professor for the Study of Mexico at Harvard University. He is the coeditor of Consolidating Mexico's Democracy: The 2006 Presidential Campaign in Comparative Perspective and Constructing Democratic Governance in Latin America, both published by Johns Hopkins. Kenneth F. Greene is an associate professor of government at the University of Texas at Austin. He is the author of Why Dominant Parties Lose: Mexico's Democratization in Comparative Perspective and was the principal investigator for the Mexico 2012 Panel Study. Chappell H. Lawson is an associate professor of political science at the Massachusetts Institute of Technology. He was the principal investigator for the 1997 Mexico City Panel Study, the Mexico 2000 Panel Study, and the Mexico 2006 Panel Study.